I made this the other weekend when we had friends over for dinner. That morning, I put everything together in the crock pot, turned it on and went about my day. 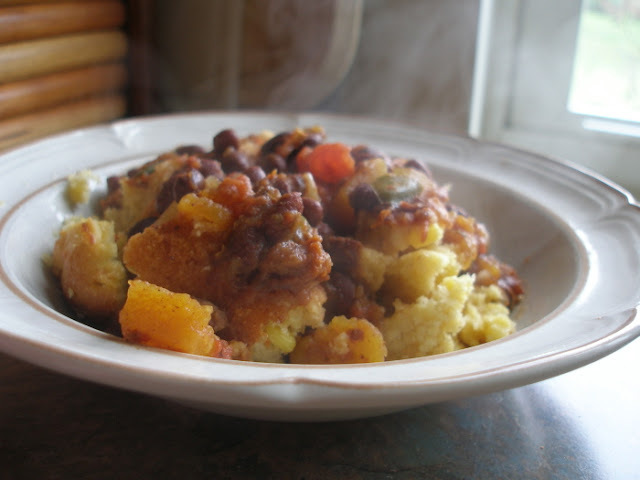 In the afternoon, I mixed up a pan of our favorite cornbread and our dinner was ready. This combination was perfect for a cool fall day. It uses up ingredients I have on hand and it makes a lot. The leftovers were excellent for lunches. Serve over warm cornbread. Makes a full (4-quart) crock pot of chili. I'm definitely going to come back to this, it looks delicious! Awesome! Thank you for sharing this recipe. My father-in-law gave us several butternut squash from his garden. I've tried a couple different things with it & my family hasn't been super crazy about it. But, I still have some to use. We like chili around here. And I like things I can throw in the crockpot. So, this might be a win win for us. That would be helpful information, wouldn't it? My crock pot holds four quarts. I'll note it above as well. Thank you:-). Another wonderful recipe! I will try it this weekend. This looks delicious! Thank you for sharing. I am adding it to my Fall recipe rotation! very similar to a recipe I have called 3 Sisters Stew, which has corn right in it. We eat it with biscuits. Delish. I like your version for the crockpot - handy. So I'm making this recipe today for dinner tonight. I think I should have paid more attention though to the size of the crock pot. I believe mine is smaller than a 4 quart size and it is FULL. I couldn't fit all the squash in. That's what I get for not paying attention to details. :) Anyway, I'm anxious to see how it turns out. We do love chili! Sumptuous—thanks, Jane. I fixed the chili today—I waited to pitch the red and black beans into the crockpot until the squash was tender. Such a dish might have pleased God, even. It's what else Cain could have done with his butternuts—made chili. In my novel Sticking Points, Anna reasons that Cain's offering, if Cain chose butternut squashes, wasn't acceptable because Cain just went out and picked any old paunchy things, didn't check them first for slugs or rot, or didn't prepare them temptingly. Had Cain baked them and dabbed butter on, though? Sublime. This chili, too. I made this chili for my family yesterday, but substituted sweet potatoes for the butternut squash. It was wonderful good. And poured over cornbread..... o my..... A fantastic fall supper. Thanks so much to those of you who tried it and reported back. I'm so pleased that you enjoyed it, too.